If you read many blogs then you are sure to have come across something about Piggy Paint. 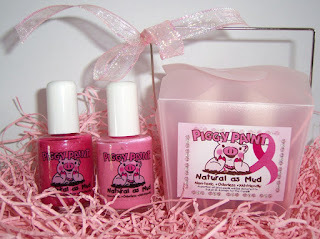 Piggy Paint is all natural, toxin free nail polish for little girls and adults alike. You will find none of the gross odors and harmful chemicals in this stuff. I am so glad to have found this product, as traditional nail polish really bothers me. Leave it to a mom to come up with a hypoallergenic, water based product to help gussy up our little ones! Ashley absolutely adores Piggy Paint! She is very sensitive to harsh odors, so regular nail polishes were not her thing. Piggy Paint allows her to paint those piggies and finger nails without having to inhale that "nastiness". I was very impressed with the nail polish. It's all natural, odorless, and looks great. They also sent us their nail polish remover to review and I couldn't be happier with it. Piggy Paint offers a great product at a great price! Piggy Paint was kind enough to offer my readers a coupon code for 15% off any item, including sale items. Just enter the code TEXAS15L. This code is good until December 15, 2009. Plus, if you spend over $25 domestic shipping is free! I am excited to tell you that Piggy Paint is offering a $15 gift code to one of my lucky readers. To enter, simply check out their website, then leave me a comment telling me what your favorite color is. This is mandatory for entry. * Follow Piggy Paint on Twitter. Deadline to enter is 11:59pm CST Wednesday 11/18/09. Be sure you leave me a way to contact you if you win. Good luck! I think Gracie would like the Forever Fancy. Thanks! I love the piggy nailpolish what fun. I like Girls Rule, myself. I would have a hard time deciding between Angel Kisses and Forever Fancy...maybe one for me and one for my daughter (who's 14 months, and I've *really* wanted to paint her nails but haven't because of the nail polish yucks). Great giveaway! I now follow Piggy Paint on Twitter! Okay, I think this is it - I just blogged about the giveaway...better late than never, right? I like Dragon Tears. Thanks for the chance! I like the glass slippers and clouds of candy! My favorite color is Forever Fancy. This would be a great product for my 5 and 7 year old girls who are constantly begging me to paint their nails. I follow piggypaint on twitter as greatgiveaways. I love Forever Fancy (and Ice Cream Dream - but we already have that one!) Great product! I like the Forever Fancy! I love the Angel kisses, thanks! Twitter follower of Piggy Paint! My favorite color is Forever Fancy! It will look great on my 14 month old's piggies! My favorite color is the sometimes sweet (red) color. Sometimes Sweet is my favorite. I follow Piggy Paint on twitter at http://twitter.com/cakeblast. My daughter's favorite color would probably be Ice Cream Dream. She loves blue! I follow piggy paint on twitter (tornxnxfrayed). Clouds of Candy is pretty awesome.